Maya Angelou is widely known for her numerous books of poetry and her book ‘I Know Why the Caged Bird Sings‘. Throughout her life she held multiple jobs, some as an editor, others as an actress and author. Maya was born Marguerite Johnson on April 4, 1928 in St. Louis, Missouri to Bailey and Vivian Johnson. Maya’s father was a naval dietician, and her mother engaged in various careers, such as card dealing and registered nursing. Her parents divorced when she was three, and they sent Marguerite and her brother, Bailey, to live with their paternal grandmother in Stamps, Arkansas. At the time, Stamps was racially segregated. She called her grandmother “Momma,” and described her as having “a deep-brooding love that hung over everything she touched.” It was there that the stage was set for an extraordinary life to come, in which Marguerite Johnson became Maya Angelou: poet, actress, author, dancer, playwright, civil-rights activist, producer and director. Maya, so-called because of a nickname her brother bestowed upon her, and Bailey lived a strict and structured life with their grandmother in Arkansas for four years before their mother sent for them. Maya remained mute for five years. When Maya stopped speaking, she and Bailey were sent back to Stamps to live with their grandmother. During this time of silence, she listened carefully and read at every opportunity. This helped her to develop proficiency for dialogue, and a sense for the cadence of the spoken word. While most who met her believed her muteness indicative of stupidity, her family and a few others knew otherwise. One teacher in particular, Mrs. Flowers, helped Maya to develop an enthusiasm for language and reading. She encouraged the young girl to read and recite poetry, and to write some of her own. With Mrs. Flowers’ encouragement and tutelage, Maya began to regain the pride and confidence that she had lost. In her late teens and early twenties, Maya had numerous jobs. She was a Creole cook, a madam, a tap dancer, and a chaufferette. In 1952, Maya married a former sailor named Tosh Angelos. Angelos was a source of stability for Maya and her son, and the couple remained married for five years. It was during this time that she adopted the name of Maya Angelou. In 1954-55 she toured with the Everyman’s Opera Company in their production of ‘Porgy and Bess’. Four years later she moved to Brooklyn to join the Harlem Writers Guild. In 1960 her activism in the Civil Rights movement blossomed. She became the Northeastern Regional Coordinator for the Southern Christian Leadership Conference, appeared in an off-Broadway play called “The Blacks,” and directed, performed in, and co-wrote the play ‘Cabaret for Freedom’. She also met Martin Luther King Jr. and Malcom X, and married a South African freedom fighter by the name of Vusumi Make. Shortly thereafter she moved to Cairo, where she was the editor of The Arab Observer, which was the only English-language news weekly in the Middle East. From there, she moved on to serve as the assistant administrator at the School of Music and Drama at the University of Ghana, and worked as a feature editor for the African Review. In addition, she was a contributor to the Ghanian Times and Ghanian Broadcasting Company. 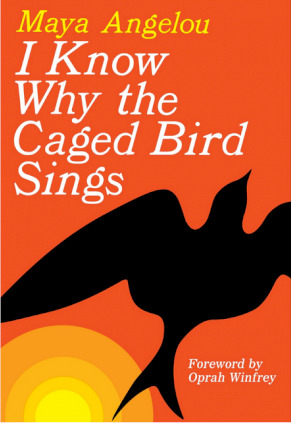 1970 brought Angelou widespread literary recognition with the release of her autobiographical book, I Know Why The Caged Bird Sings. The book dealt with her years as a youngster, up through the birth of her son. Over the next decade, Maya Angelou would publish three more autobiographical novels, as well as numerous books of poetry. Maya has been seen as a ground breaker for African American women. She has made numerous television appearances, has written and produced several prize-winning documentaries, and was the first African American woman screenwriter to have her work filmed. She has received numerous accolades, including nominations for a National Book Award and for a Pulitzer Prize. In addition, she has held posts as a writer-in-residence at the University of Kansas, a chair in American Studies at Wake Forest University in North Carolina, was a distinguished visiting professor at numerous universities, and was selected by the Ladies Home Journal as Woman of the Year in communications in 1976. In 1993, President Clinton asked Angelou to deliver a poem at the inaugural ceremonies, another first for an African American woman. A poet hadn’t read at an inaugural ceremony since Robert Frost in 1961, when he read at the induction of John F. Kennedy. Maya composed a poem specifically for the inauguration, entitled “On the Pulse of Morning“. This remarkable woman has enjoyed, endured, and embarked upon an astounding journey to get to where she is today. As is the case with many of the creative geniuses, Angelou had a few quirks. She regularly woke at 5:00 a.m. to go to a motel room near her home, where she reclined on a fully-made bed with a Bible, a dictionary, a thesaurus, and a bottle of sherry. There she wrote her poetry and prose on yellow legal pads. In addition, she was married several times, though she declined to disclose how many. In general, she was not forthcoming with respect to her personal life. However, her respect for humanity in all its forms, beautiful and imperfect alike, was not quirky, but altogether admirable. They allowed her to write with candid honesty. Maya Angelou passed away on May 28, 2014 in Winston-Salem North Carolina. Her novels remain widely read and taught in schools, and her life and work continue to be the subject of much discourse. She was as self-aware as a person could hope to be in life, and was a role model for numerous people, from school children to adults, of all races and socioeconomic walks of life.